Samsung Level series promises "premium audio" | What Hi-Fi? Samsung Level series promises "premium audio"
Samsung has announced details of a new series of premium audio products, called Samsung Level. 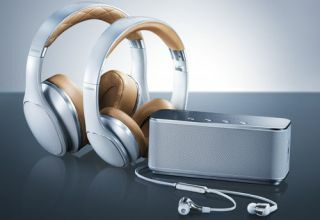 The Samsung Level range of accessories promises to deliver "the best possible sound experience for smartphone or tablet", and has been launched with three pairs of headphones and a wireless Bluetooth speaker. The Level Over, Level On and Level In headphones are pretty self-explanatory in terms of size and design, while the wireless Bluetooth speaker is called the Level Box. The Samsung Level Over over-ear headphones feature a 50mm Neodymium driver and claim active noise cancellation using an external mic that listens for and blocks out external sound. There's also an in-line mic on the detachable cable for voice calls. They feature aptX Bluetooth wireless connectivity and claim up to 30 hours listening time when active noise cancellation is turned off. Launching alongside the headphones is a Samsung Level app, available on Android via the Google Play store, which offers various sound EQ modes and other audio features. The Level On cans are a more compact, on-ear set of headphones, and use a 40mm driver and come with a detachable cable. Meanwhile, the Level In earphones sport a three-way speaker design, with two balanced armatures and one dynamic speaker. Joining the headphones is the Samsung Level Box, a compact Bluetooth speaker. Measuring 6 x 16 x 7cm (HWD), it has a 56mm driver and a passive radiator design, plus NFC (near-field communication) pairing for wireless Bluetooth streaming from a tablet or mobile phone. The Level Box can also work as a speaker phone for hands-free calls, thanks to a built-in mic. There's a micro USB, an audio cable and a travel adaptor supplied. The new Samsung Level products are due out in selected markets in mid-May. Sadly, there's no word on prices as yet.